For a traditional Hindu wedding, there aren’t many venues that unite religious authenticity with stunning countryside with as much aplomb as the Oshwal Centre in Potters Bar. It’s easy to forget that the spectacular venue is in the UK, such is its striking resemblance to the derasars of India. 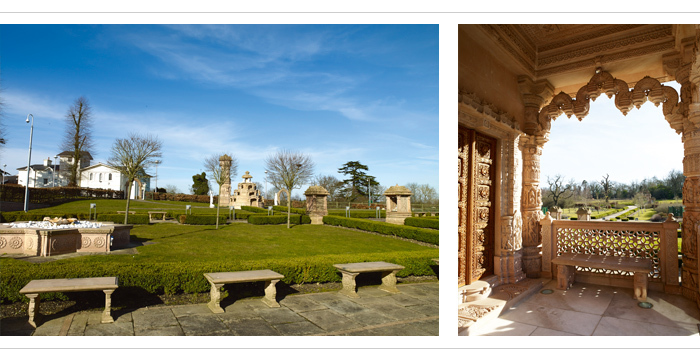 The exquisitely carved Jain temple is set amongst landscaped gardens and fields, providing a vibrant backdrop for photos. The Centre is registered to conduct civil ceremonies and also has in-house registrars to perform the nuptials. Two large halls, each with a capacity of up to 990 guests, are open plan and something of a blank canvas, allowing couples the freedom to incorporate and work with a multitude of décor options. Thanks to the obstruction-free space, guests will be able to mingle while photographers will be unhindered by pillars and free to capture lifelong memories from all angles and distances. 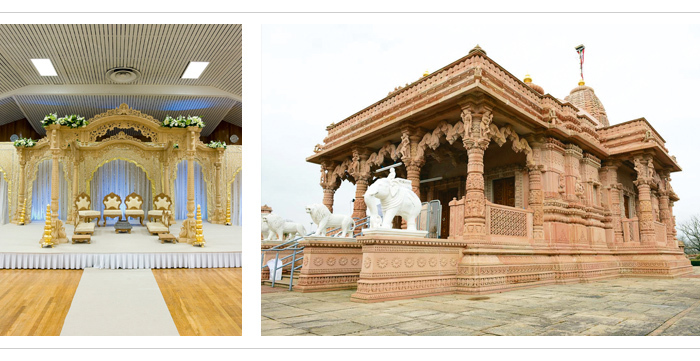 The Oshwal Centre is the location for Jain weddings and special events. The team has worked with thousands of couples and is highly skilled in helping them enjoy the Big Day. You can call in your own caterers. There’s a spacious kitchen and preparation space available, complete with all the features of a professional kitchen. In keeping with religious and cultural beliefs, guests are asked to leave behind alcohol and is a purely vegetarian facility. The Oshwal Association has been around since the late 60’s and the Centre has hosted hundreds of thousands of weddings in the years since. It’s perfect for large events, with for over 300 cars, a children’s playground for the small and the restless as well as changing rooms for the bridal party. You can extend Big Day invitations to more than 900 family and friends in each of the two large halls. Located in Potters Bar, the Oshwal Centre is within easy reach of London and the south east.